D.C. medical malpractice lawyers give away resource guide to help special needs children. 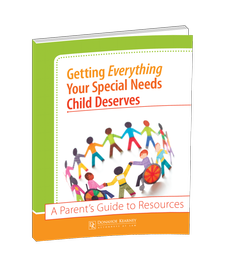 Why do we give away a resource guide for special needs children when it costs us to research, write, publish and distribute it? Two answers: 1) Because the information is too important not to; and, 2) Because the information is too valuable to sell to families who need it. We know from years of working with families who have a child who is paralyzed, has cerebral palsy, or a disabling condition that requires around the clock care, that these parents don't have the time to do the research, calling around, getting information for their special needs child. All of their time and energy is focused on caring for their child's needs. And we know there are a lot of resources and programs available for kids with serious medical conditions and injuries, and for children who can't function on their own. With our medical malpractice cases, once we get a settlement in a child's case, there are financial resources available to help make the child's life better - whether that's a handicap accessible house, a wheelchair accessible van, a computer, and other things. But let me be clear. We make our living holding hospitals, HMOs, healthcare companies and their doctors, nurses and providers responsible for harming patients, especially children, due to medical malpractice. But we give our resource guide away to any family with a special needs child - even if they don't have a medical malpractice case we can help them with. If this is you or someone you know, call us at (202) 393 - 3320 and we'll send out a free resource guide today. Worried that your child's serious health condition may have been caused by mistakes made by a hospital, HMO or doctor? How will you know whether your child's condition was caused by medical malpractice? How can you deal with the doctors now? What should you do? It's a difficult subject to talk about. But like everything else about being a parent, you can do it. We published a short, easy to use guide to get you started. As we like to say, it's a process - and you can't go it alone. But don't wait - get answers that can help you and take care of those worries now. Call us at (202) 393 - 3320 or click here to order your free copy of the parent's guide to medical malpractice.